Academic, public, school, and special library markets - the TLA Annual Conference has a proven track record of offering unparalleled opportunities to reach decision-makers from across Texas, and from every library market. No other regional conference can offer the customer volume, the access to buyers and users, and the ongoing support that you’ll find here. 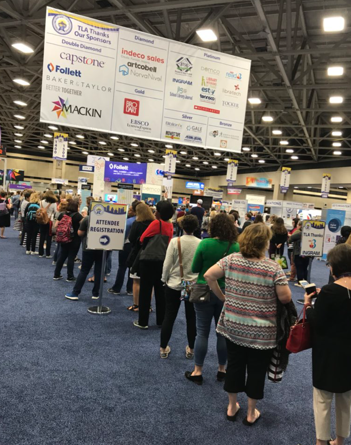 Texas librarians love the bustling exhibit hall area and view the exhibits as a must during the Conference. TLA offers unparalleled exposure and opportunities to market your product or service to the library community. With a representative from virtually every area of the industry at the conference, with expenditure budgets ranging in excess of $2.5 million per organization, and with a projected attendance of more than 7,000 professionals , can you afford not to exhibit at TLA? The primary exhibit space is 10′ x 10′ and configurations thereof. A few 5′ x 10′ spaces are also available. Over 80% of exhibitors renew each year so it is important to reserve your space as soon as possible. Exhibit spaces are not furnished. Exhibitors may bring their own furniture or they can conveniently order furnishings through TLA’s general service contractor, Freeman. Freeman offers furniture, carpeting, signage, and much more. Other services provided by official contractors are housing, drayage, transportation, electrical, internet, computer rental, lead retrieval, and floral. All official contractors are listed in the service kit which is available in January. The official housing company is onPeak. You can book your housing today. Please heed our warning about poachers. All exhibitors receive the ExpoInfo monthly email blast to assist you in planning, marketing and promotion. All exhibitors receive complimentary listings in several TLA publications available at conference and throughout the year. Designed to help draw attendees and build traffic on the Exhibit Floor. When you are ready to apply to exhibit, please read the TLA Exhibitor Rules And Regulations, review the exhibit hall map for exhibit space selection, select your 4 exhibit space choices, and complete an online exhibit application. Contact Cindy Boyle, TLA Exhibits Manager, for assistance in exhibit space selection or if you have any questions about exhibiting at TLA. Questions? Contact Cindy Boyle, TLA Exhibits Manager, for assistance in booth selection or if you have any questions about exhibiting at TLA.